In a nation that is more sea than land (less than one per cent of the Maldives is land), the weather obviously plays a significant role in day to day life. 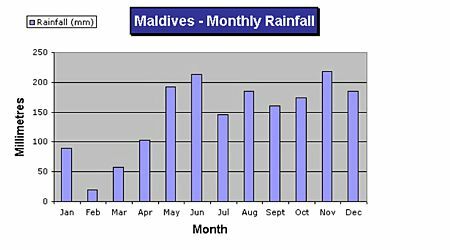 Since earliest times, the Maldivian people have organized their lives around a calendar of nakaiy - a series of 13 or 14 day intervals, each with a predictable weather pattern. Every year brings two monsoons, iruvai (the north-east monsoon) and hulhangu (the south-west monsoon). To a visitor, this simply means the hot and dry season (iruvai) and the hot and west season (huhangu). 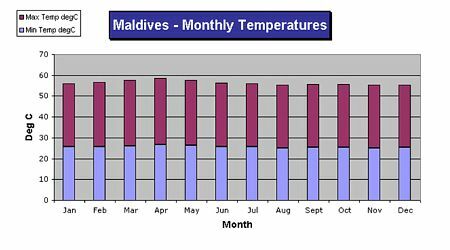 But to the Maldivian people, each monsoon means a series of nakaiy which determine lifestyles for the next six months. This calendar is still used today to determine the best times to fish, travel or cultivate crops. Some people even use it before planning a marriage or building a house. It is said, for example, that children born in Maa amkaiy will attain high stations in life and that those born in Uthura nakaiy will be deeply religious. Jan 19 – Jan 31 Huvan Calm seas, blue skies. Fishing in the east is good. Feb 14 – Feb 26 Hiyaviha Seas are calm, days and nights are hot. Mar 26 – Apr 7 Reyva If storms occur they may be severe. Fishing is good in the north. Some trees are cut down and burnt. Apr 8 – Apr 21 Assidha Begins with a storm, then becomes hot and dry. People allow themselves to be wet by the first rains, believing it will bring them good luck. Fishing is poor, millet and trees are planted. Apr 22 – May 5 Burunu Begins with a storm and strong winds, then becomes calm. Fields are cleared, trees chopped and seeds sown. May 6 – May 19 Kethi Dark clouds, frequent rains. Dried leaves are burnt and the ashes spread over the fields. Sowing continues. Jun 3 – Jun 16 Miyahelia Storms, rough seas and strong westerly winds. Fields are sown and weeded. Jun 17 – Jun 30 Adha South westerly winds, light rain and schools of fish. Fields are weeded and transplanted. Jul 1 – Jul 14 Funoas Storms and rough seas with frequent sudden gales. Weeding and transplanting continues. Jul 15 – Jul 28 Fus Wet and overcast. Fishing is good. Jul 29 – Aug 10 Ahuliha Less Frequent storms, calmer days. Grain harvests are reaped. Aug 11 – Aug 23 Maa Generally calm. Harvesting continues. Aug 24 – Sept 6 Fura Isolated showers, usually dry with light north westerly winds. Harvesting continues. Oct 18 – Oct 30 Hey Strong winds from all directions.Fishing is excellent and the markets are filled with large tuna. Nov 1 – Nov 13 Viha Calm days. Fishing is good. Nov 27 – Dec 9 Dosha Light north-easterly winds. Good fishing. In tourist jargon, the seasons are described as ‘high’ and ‘low’. From November through to April, tourists flock to the islands to enjoy clear blue skies and tropical sunshine. From May until October, the weather can be temperamental – a mixed bag of sunshine, showers and storms – and tourist prices are slashed to entice visitors in spite of the weather. Year round the temperature rarely falls below 25degC most often settling around 30degC.